As civil designers, one of the advantages of model-centric workflows is the dynamic, real-time feedback and information we can garner from our design software. Bentley’s OpenRoads technology provides that visual feedback in the design canvas, but also throughout the interface. When working with templates there are three places where the software uses coloring to give the designer information about the model. The first is on the Template Drops listing in the Corridor Objects dialog box where Template Drop names are coded as follows: BLACK is templates that are in the currently attached ITL, that are unchanged from the ITL, RED is templates that originated in the currently attached ITL, but have been edited through the edit “Template Drop” command, and BLUE are templates that are not present in the currently attached ITL. 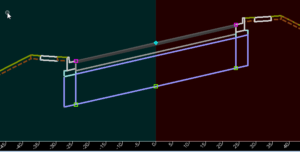 Secondly, we see coloring in the Dynamic Section views, the boxes here are indicating points that have been overridden by either point controls or parametric constraints. 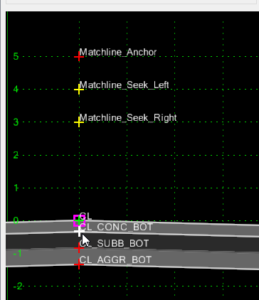 In this example, the magenta boxes show where superelevation has created point controls on the edge of the pavement and the green where the aggregate base depth has been increased with a parametric control. Finally, colors are applied to points in the Create Template dialog (they also show up in one of the “Edit Transition” dialog boxes). There are four colors that the points will be represented with. White is a selected point or a point that a component will be connected to, green is an unconstrained point, yellow a partially constrained point (only one constraint defined), and red a fully constrained point (two constraints defined). Steve is a Senior Consultant at EnvisionCAD with over 15 years of experience in linear and site design, and design technology support. He serves as a subject matter expert for civil design software on both the Bentley and Autodesk platforms.